Last month, I completed my Early Field Experience at Ridgemont High School under advisor Mrs. Stephanie Jolliff. During my time at Ridgemont, I was able to be a part of “Ag in the Classroom Day” at Ridgemont Elementary, where high school students educated younger students on topics such as feed rations, alternative energy, hydraulics, and seed germination. We also participated in two other events at the elementary, “Edible Car Day” and “Field Day”. It was great to see the unification of the district as students of all ages came together to learn throughout my experience. I helped students with their shop projects as well, as the freshmen were making birdhouses and upperclassmen were creating metal projects of their choice. During our time in the shop, I learned how to plasma cut and grind metal, which was so much fun!! I even had the opportunity to teach Mrs. Jolliff’s classes on the last day, which was a very different but positive experience! Outside the classroom, I attended a variety of meetings with Mrs. Jolliff including building and district wide staff meetings, a grant meeting, a meeting on National Chapter applications, and an ‘At Risk’ students meeting. I had so many wonderful experiences packed into my two weeks of EFE, but through it all I was also able to gain a much deeper perspective on education and the difference that a compassionate and dedicated teacher can make. At the ‘At Risk’ students meeting, we met with the principal and guidance counselor to discuss several ag students who had failed core classes and were working to make plans for improvement. I was surprised at the names that were mentioned because even after a short time, I knew that these were students who exceled within Mrs. Jolliff’s classroom. 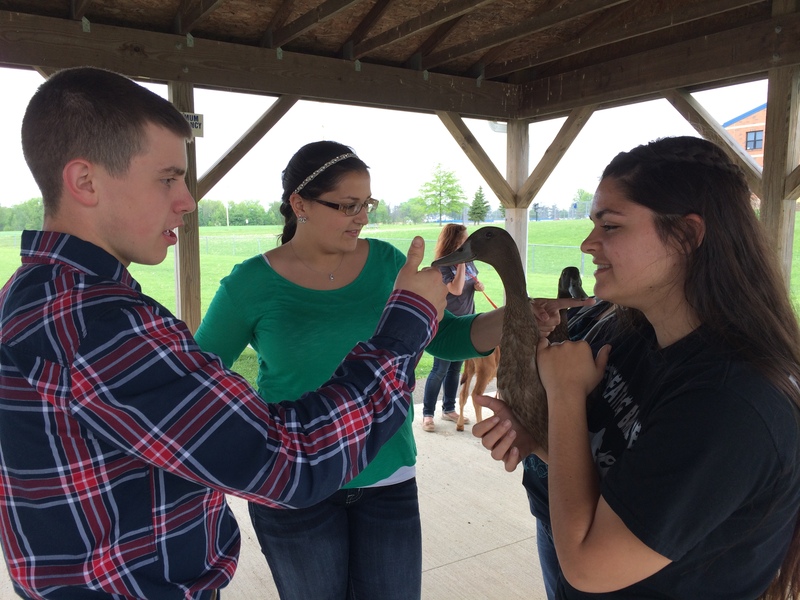 It appeared that these students were using FFA as an outlet. Even though they hadn’t had the easiest road, they had found a safe place within the FFA and other staff members recognized that. Legitimate plans were made for each student and many involved doing extra work for Mrs. Jolliff that would transfer for various other credits (like writing papers on agricultural topics for English). I was thrilled to observe the impact that my cooperating educator was making on her community and on each individual student. It was truly inspiring and I am excited to be a part of an industry that can impact people for the better in ways like these. Courtney Fulton assists students at Ridgemont High School during her Early Field Experience. The Ohio Pork Ambassador Team program (OPAT) serves as an opportunity for qualified youth to act as a voice for the Ohio Pork Industry. It is the goal of the program to educate ambassadors about the pork industry so that they may better share their own agricultural-based story, including their background and experiences. Team members will be involved in communicating with consumers on topics such as food safety, nutrition, and animal care practices of the pork industry. Promotion of Ohio’s pork industry shall be carried out through the development of skills in self-confidence, communication, leadership, and teamwork. The deadline for submitting an OPAT application is July 6, 2015. Additional details about the program, and an official application, may be accessed by visiting OhioPork.org. I was given the wonderful opportunity to do my Early Field Experience (EFE) with the Northwestern-Wayne FFA chapter for two weeks. Here, the students were welcoming and there was a lot to finish up before the school year was over! My cooperating educator was Heather Tegetmeier. 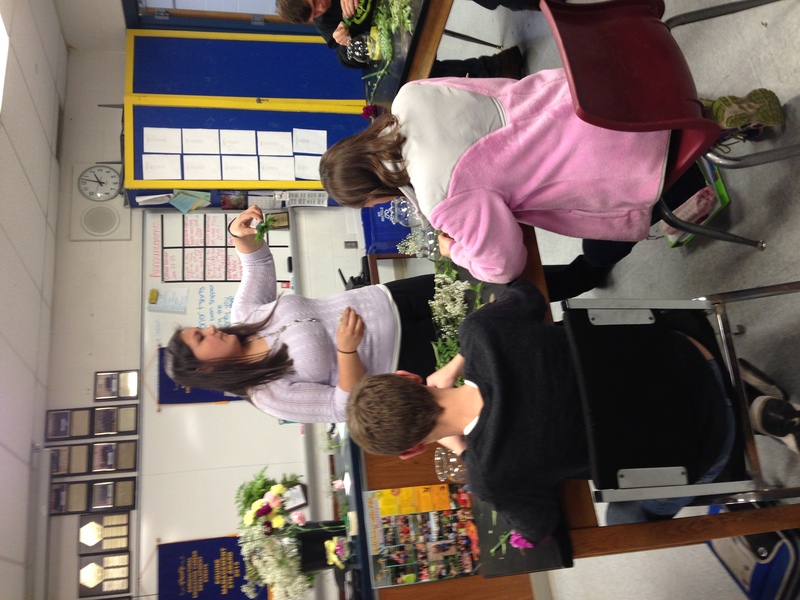 Heather has taught at Northwestern-Wayne schools for 15 years as one of two Agriscience Educators. Heather teaches the seventh and eighth grade programs taught at Northwestern Middle School as well as teaches Ag Science I, Environmental Sciences and Natural Resources, and the chapter’s leadership class. Heather teaches alongside Dan Fulk, who was also Heather’s cooperating educator when she was in college. 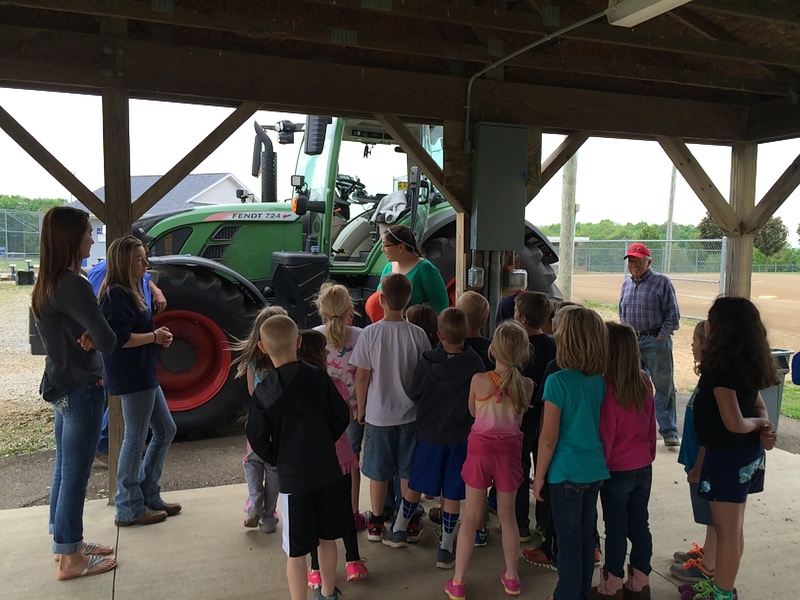 The Northwestern-Wayne FFA chapter has about 135 enrolled FFA members and about 200 middle schoolers who go through the program each year. During my placement, I was able to work with the kids hands on, and learn their stories of why they love agriculture. Heather helped me prepare many lessons and work with her on finishing the projects the students were working on. It was nice to go into a different classroom and see how another chapter runs their activities in comparison to what I knew from my home chapter. It was especially exciting to see a two teacher program that also included a middle school program. 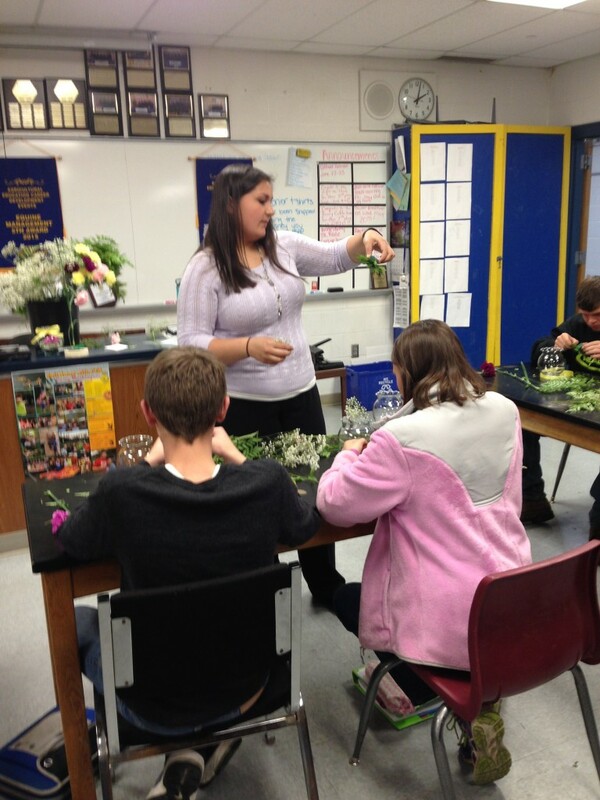 For Heather, she only usually interacted with half of the chapter during the school day, but she most definitely engaged in the Ag Ed setting. As I watched Heather work with the students and get used to the daily schedule of 7-4pm days, I started to feel the transition from student to educator. I was able to do my very own lesson on how to make ice cream and even participated in the chapter’s Ag in the Classroom event where they went to the elementary school and talked to first graders about animal and tractor safety. 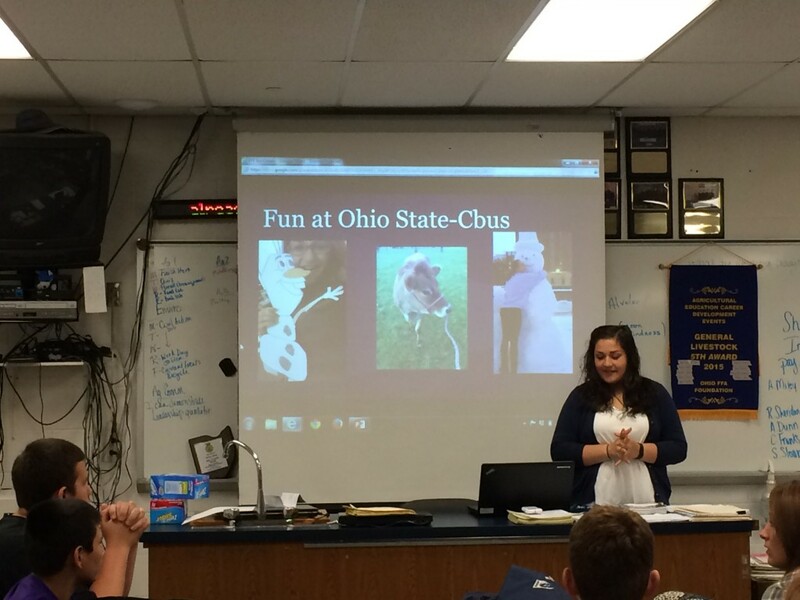 It was great to have the students call me Ms. B and to want to talk to me about my FFA experiences, my time at Ohio State, and what it was like to do my EFE placement. For the first time, I was able to see that spark in the students eyes that I too had when I was in high school. This, making a difference in student’s lives, it for sure what I want to do as my future career. Growing up in a small community, I felt at home in the little rural town of West Salem. It was nice to get back into the classroom where many of my FFA memories were created. 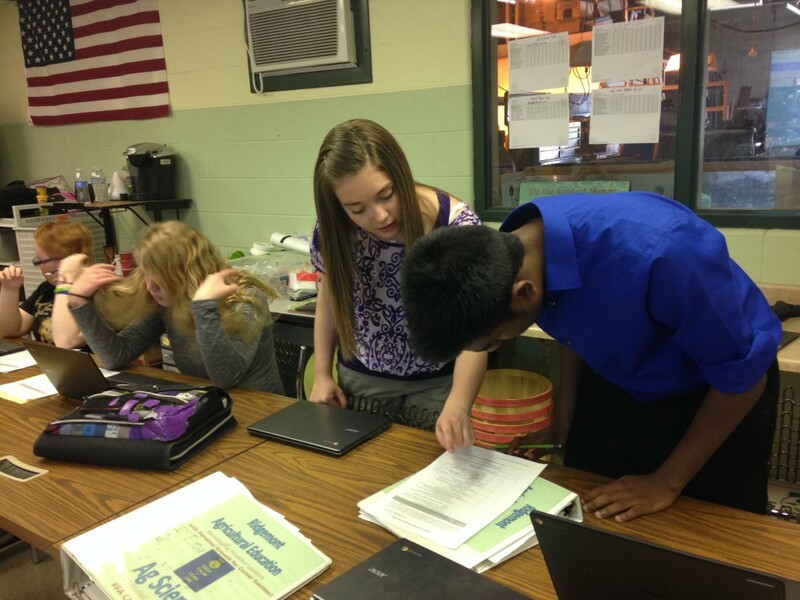 When a student does their EFE, they are to basically shadow their cooperating educator, taking note at their teaching techniques, the way the rooms are set up for the kids, and getting a first hand look at the behind the scene actions that Agriscience Educators participate in. By the end of my EFE placement, my eyes were opened up to the exciting and wonderful world of becoming an Agriscience Educator. From the hands-on field trips to developing career skills, I can surely say that I am ready to start my career in Agriscience Education! I have spent the last few weeks experiencing new and exciting opportunities in my home county, Washington County. Over the course of four weeks I have been working at The Ohio State University Extension Office of Washington County completing my Early Field Experience. My EFE is a part of my major at Ohio State as I am majoring in community leadership with a specialization in community and extension education. These past few weeks have been so much fun as I have gotten to develop skills that will help me in the future. I am working with Alison Baker the extension educator specializing in 4-H Youth Development. I grew up in Washington County with a huge passion for the fair and 4-H. This same passion led me to go to college and make a career of it. I am so very excited to start this journey in Extension. 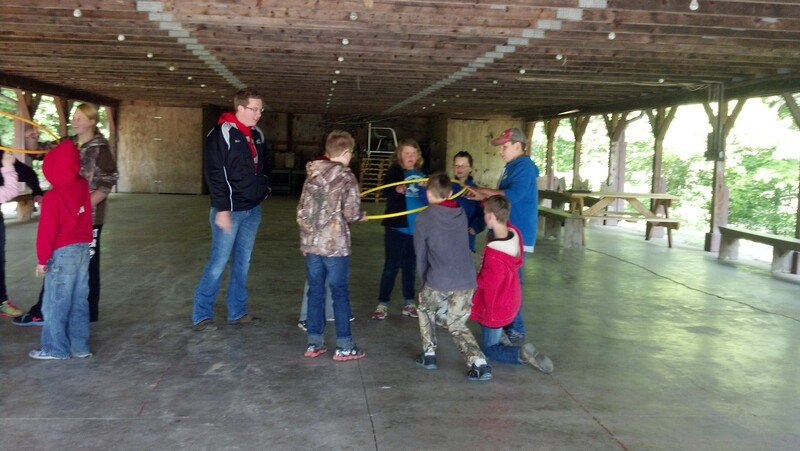 Blake assists youth with leadership activities. I have learned multiple aspects of youth development and education while doing my EFE with Washington County. From attending a horse evaluation to writing a cloverbud connection for the quarterly newsletter, I have expanded my horizon to new and exciting levels. Before starting my EFE I knew little about extension and how they worked with fairs and 4-H, but now I have a better understanding of how extension works. I am very excited to start this fun and exciting career in community and extension education! The National FFA Organization will be selecting presenters to deliver workshops at the 88th National FFA Convention & Expo in Louisville. Presenters will present at least one workshop that they write themselves. The workshop objectives will be cross-walked to the National FFA Organizations precepts for premier leadership, personal growth and career success. The presenter(s) will be paid $200 for development of a workshop and $100 per presentation. If a workshop has more than one presenter, the payment will be split among the presenters. Deadline for submissions is June 15, 2015. Additional information here. With a major in community leadership and a specialization in community and extension education, my early field experience took place at the Marion County Extension Office. The Marion County Fair takes place the last week in June into July. Last minute details were in full swing as the office prepared for the fair activities. I helped the extension educator plan activities for clover bud day and 4-H camp, as weak as prepare mailings sent to advisors, parents, and members. 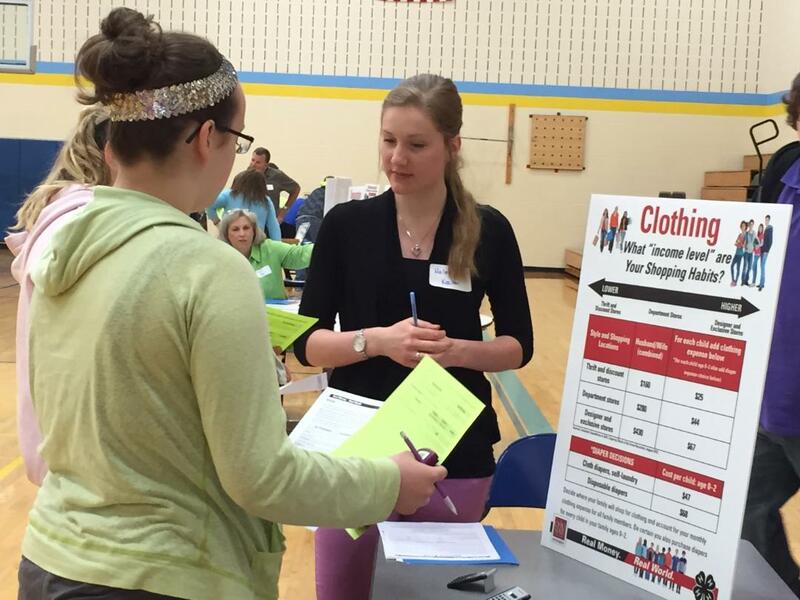 Haley talks with youth about extension programs. The part I enjoyed most was attending the meetings for the Jr. Fair Board, camp counselors, cloverbuds, and dog trainings. Being able to interact with the youth and volunteers in the 4-H program was a highlight for me. I also had the opportunity to lead a team building activity with the camp counselors, seeing them work together and accomplish the task as a team was a neat experience. One thing I will take away from this experience is the new appreciation for our county educators. I am a ten year 4-H member and this experience gave me a new point of view. Our 4-H educators put in many hours and effort into making sure the fair is successful each year. Obstacles will and do occur but it is how you deal with it and what you take away from the experience that means the most. I enjoyed the time I had in the Marion County Extension Office. It helped me see the role that the extension educators play in each county. 4-H is a great organization for youth and their families and I am excited to one day be a part of our growing agricultural industry. Like this Newsletter, but you graduated?